Zac Efron: We've Got A Job For You! Are you a young, handsome, “white guy” in your mid-to-late 20’s? Here’s a fabulous job opportunity: You get to be the arm candy of the 20-something year old girlfriend of a 60-year-old Los Angeles attorney. Ricky Van Veen, co-founder of CollegeHumor and current proprietor of an IAC production company, Notional, posted the email on his blog. 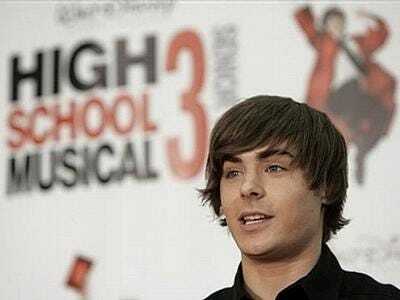 “Given the audience, I give it another 24 before it gets optioned as a Zac Efron vehicle,” he wrote. A strange, but serious ISO. I work with an attorney who is in his early 60’s. He has a girlfriend who is in her early 20’s. I know, I know, but hey – we live in LA – it happens. The issue: The girlfriend’s parents don’t know about the older bf and they have been bugging her about her lack of a bf. So, here’s what I need: a really good-looking and respectable-looking white guy in his mid-to-late 20’s who will be her stand-in boyfriend. No need to meet the parents in person. Just need the guy for about one day to go around to various locales around LA and take photos with the gf in various outfits, so that she can forward the photos to her parents and shut them up. The individual will be paid for his time, but…as funny of a situation as this is…he must be dependable and he must be discreet. Really.